Can only be built around the entrance of a base and can fire at both ground and air units. It cannot move. 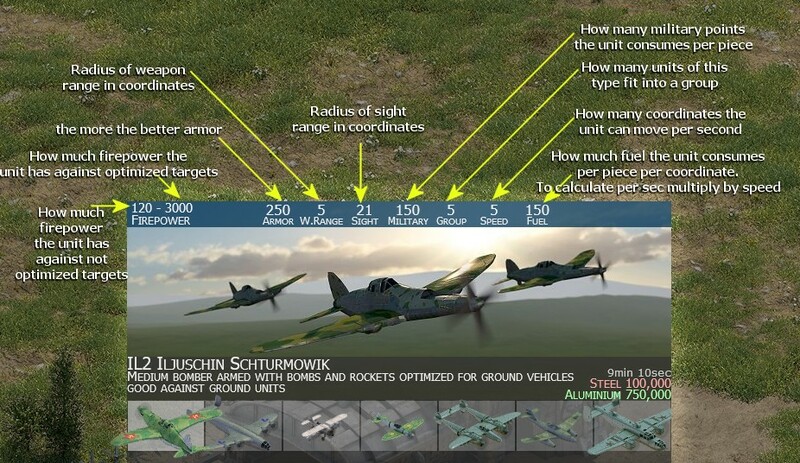 Flaks have an extremely strong armor. The more units shoots at it, the less effective each individual shot will be. Example: 100 Bredas do 3 times as much damage as 10 Breads. Have the advantage of being able to drive everywhere on the map except obstacles such as bases, rivers, mountains etc. If they have no Antiair weapons, they are defenseless against air units. They can leave the map via highways (who are in the middle of each map edge) to get to other maps. Are limited to the river but have very low fuel costs and a very high weapon range. They can leave the map over the river at the edge of the map to get to other maps. Can only drive on tracks but have very low fuel costs, a very high weapon range and are traveling pretty fast. You can leave the map via the tracks at the edge of the map to get to other maps. Can navigate anywhere on the map, overfly obstacles and travel fast. They can shoot tanks, boats and trains (that do not have antiair weapons can) without that they can shoot back to the air units. Air Units can leave the map via highways (are in the middle of each map edge) to get to other maps.